The iLiad ebook reader from iRex Technologies is more than just a reader, like the Amazon Kindle. It also lets you use a stylus to write in the margins, underline and otherwise annotate your ebooks. The iLiad has great specs, including an 8.1 inch diagonal display with 768x1024 pixel resolution. The iLiad is not merely about reading… it is about writing too. Thanks to the integrated Wacom Penabled technology you can use the stylus to make notes, underline text and write comments in documents do your favorite crossword or Sudoku puzzles or even sketches and draw. The stylus can also be used to quickly and easily navigate your way through the iLiad menu and your documents with a whole library at the tip of your stylus. The following video presents an exhaustive look at this device. The clearest early reference to the e-book reader concept that I know about is the opton from Stanislaw Lem's Return from the Stars, a prescient 1961 novel. See also the comments on my earlier article on the Amazon Kindle e-book reader. 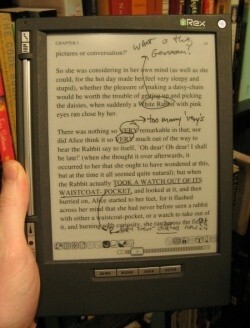 Via Putting pen to e-paper: iRex iLiad ebook reader review and iRex; buy the iRex Iliad in the US. Thanks to an anonymous reader who commented that the iLiad could count as one of the Top Ten Star Trek Techs.